While BamBam88 may best be known to western fans for putting out outstanding Kinnikuman Apparel they recently dropped a line of T's featuring WWE Legends. "Hacksaw" Jim Duggan - Hoooo, tough guy! The line is exclusive to the Japanese market, but I was able to score a couple of shirts from Rakuten ~ 肉. I am highly impressed by the quality and attention to detail on the shirts, with the design taking me back to the glory days of WWF Wrestling in the 1980's. The line is officially licensed by the WWE, and would certainly have the potential to do quite well with wrestling fans in the USA (If they were to be sold here). This could be a real segue for BamBam88 getting all of their products overseas - hint, hint. Be sure to head over to BamBam88 and check out the new WWE Legends Collection! The last post of 2010 ~ see you in 2011! Kinnikuman Nisei Kyukyoku Choujin Tag Vol 24 was released this past week, and features some of the best cover art to come out of the series thus far! If you have been following Shimada-sensei on Twitter at all over the past few days, you know that due to falling sales and growing lack of interest in Kinnikuman Nisei, the Nisei franchise may be coming to an end. While Yudetamago are currently weighing their options on how to keep Kinnikuman alive, this is really sad news for Kinnikuman fans everywhere. Now is the time to step up and show your 友情パワー (Friendship Power) by supporting Kinnikuman in anyway you can! I feel some serious 友情パワー (Friendship Power) every time I set foot in the Nakano Broadway because of one man... "Micro" Miyakoshi. Not only is Miyakoshi-san a bona fide ユデッキー (Yudekkii), the guy is arguably one of the greatest living Keshi-masters on the planet. I met Miyakoshi-san a few months back while perusing the halls of the Nakano Broadway. I showed him my prized Kinnikuman collection pics stored on my iPhone, and we have been brothers-in-keshi ever since. He has worked with me countless times online to find Kinkeshi and Kinnikuman items, and I cannot say enough nice things about him. Micro Miyakoshi displaying some Microkan goods! 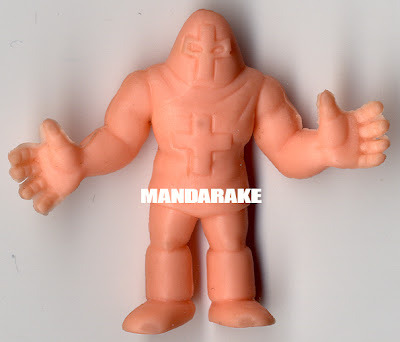 The Microkan is hallowed Kinniku ground in my books and has been the stuff of legend for years on English Kinnikuman and M.U.S.C.L.E. message boards and blogs. 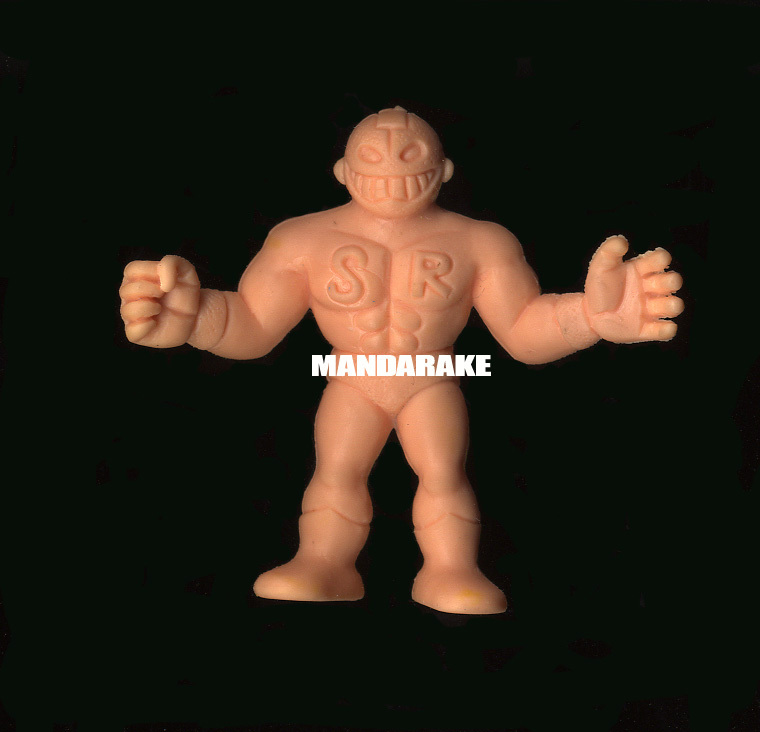 I am really excited that I was able to secure this interview and really want to thank Mandarake for their kindness and generosity! Nama Niku: Can you tell me a little about the history of the Microkan? Miyakoshi: The Microkan is one of the newer additions to Mandarake and opened on February 20th 2003 on the second floor of the Nakano Broadway. At first the Microkan specialized in selling key chains, stuffed animal and other similar type goods but we made a changed and shifted our focus to selling late 80's to late 90's toys such as Kinnikuman SD Gundam, Dragonball etc. This decision really shaped the new direction of the Microkan. When I started working at Mandarake, only a few items such as Kinkeshi, SD Gankeshi and Dragonball Keshi were sold at the Microkan. I really immersed myself in all things Kinnikuman in hopes of expanding our Kinkeshi section. After this move we started expanding with other Keshi lines and Shokugan (Toys that are packaged with Candy). We later moved to the 4th floor of the Nakano Broadway on Oct 1st 2005, where I had more time to study and really dive into the world of Keshi. I completely devoted myself to the world of Keshi which lead to the style and feel of the Microkan as you see it today. Nama Niku: Do you collect Kinkeshi yourself, and if so, what is your favorite figure? Miyakoshi: I do not have nice Choujin like many customers of Microkan have but I collect Kinkeshi for sure. When I start working at Mandarake, I used to purchase Kinkeshi, and really tried to live around Kinkeshi to gain a feeling and understanding of what they were all about. Nama Niku: What is the most exciting item you have come across while working at Mandarake? Miyakoshi: That has got to be Silver Riki, which is one of the Four Phantom Kinkeshi that were never officially released (by Bandai) for sale. We really did not have any information on this figure but knew that it was one of the phantoms. It seriously showed up out of nowhere and gave me goose bumps when I saw it. It was like the heavens opened and he was just there. By the way, Mandarake is currently buying Silver Riki Kinkeshi for 200,000円 ($2,400.00) - if you happen to have one, please let us know!!! 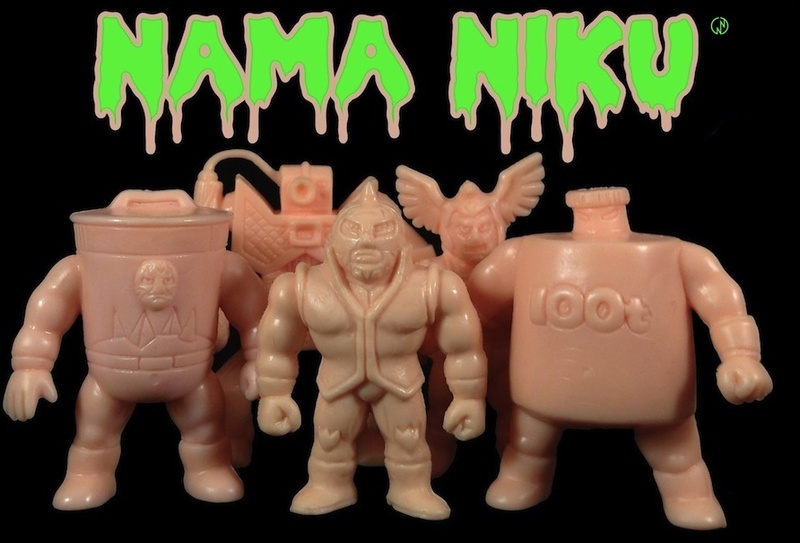 Nama Niku: Muscle Kinkeshi were made in Japan by Bandai, but distributed overseas by Mattel. There is a lot of mystery in America about how they were made, and why only a limited number of figures were released overseas. In all your Kinkeshi research, have you ever come across any information about M.U.S.C.L.E.? Miyakoshi: We have not really seen much of M.U.S.C.L.E itself you know. I didn't hear anything about the American version of Kinkeshi until they had been discontinued. This is the same with many other series and types of toys, as the popularity dies down, the items gradually stop selling (and you do not hear about them until after the fact). For me however I'm rather curious about how big the M.U.S.C.L.E. boom was in America at the time. Sorry I was not much help in that area... My path to Kinkeshi enlightenment still continues... (Miyakoshi has also hinted that M.U.S.C.L.E. may be getting a mention in the next issue ofコンプREX, there is quite a bit of mystery surrounding the M.U.S.C.L.E. exclusive Terri-Bull/Buffaloman sculpt). Nama Niku: Kinkeshi are quite popular with overseas collectors. What is the best way for people overseas to order from the Microkan? Miyakoshi: Well, we have the Mandarake Homepage which hosts out Mail Order site however we rarely have any of our Kinkeshi items listed on the website. If you have specific Choujin that you are looking for, you can send us an email and we can check to see if we have any in stock. If you are looking for a ton of individual items it might be hard for us to look for everything, but I certainly would like to spread the word all over the world that we are more than happy to help! Nama Niku: Lastly, why do you think Kinkeshi are still so popular today? Miyakoshi: I think that the popularity of Kinnnikuman is due to the warmth and character of the figures which is something that we no longer see in this day and age. Also, the story still continues in Nisei which is a testament to the power of the Kinnikuman story. All these factors coming together I would say is the reason for the popularity continuing. There are also so many Kinkeshi items in all sorts of colors to collect. Kinkeshi are cheap enough that kids can purchase them with their allowance money, and it is really a fun hobby. The figures themselves feature high quality molding jobs, which are just amazing. You really have to collect Kinkeshi to get a true feeling for what they are all about. We are constantly updating information via the Mandarake website and Twitter, so please check it out! Website: http://www.mandarake.co.jp/ and Mandarake English Site! 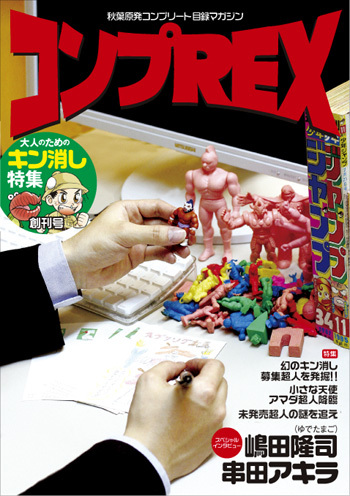 The Microkan also sells コンプREX/Comp Rex which is a publication dedicated to all things Keshi. Nama Niku: At this point I would really like to thank Mandarake and especially Micro Miyakoshi for taking the time the time out of his busy schedule to speak with me. There is an incredible article about the Four Phantom Kinkeshi and other rare Kinkeshi in Vol 1 of コンプREX. While I believe this issue is out of print, there still may be a copy of two kicking around the Microkan. Mandarake's English website is extremely easy to use and they accept PayPal! Please enjoy the original Japanese interview as well! I have searched the web from the USA to Japan, and must say that one of the best places to get great deals on Ultimate Muscle (キン肉マンII世) Kinkeshi and MOC M.U.S.C.L.E. is Kinnikumart! The prices and selection at Kinnikumart are great, and the owner Sherrie is extremely easy to work with and honestly as nice as they come! There is nothing like building your collection while picking up great items from another dedicated fan. Kinnikumart is also one of the few places that you can actually buy the 20 pack Exogini Keshi Pyramids! BamBam88 ~ Kinnikuman Zebra and Soldier Worker Caps! Order from your caps from BamBam88 today! Words cannot express my gratitude and appreciation towards Shimada-sensei for taking the time out of his busy schedule to answer questions for my blog. His incredible talent and limitless imagination are awe inspiring, and I am thrilled that he has been willing to reach out to this American ユデッキー! The time Shimada-sensei takes on a daily basis to interact with fans is the stuff of legend. I cannot thank him enough for the interest and kindness he has shown towards Nama Niku! While I can think of an endless barrage of questions that I would like to ask about characters, plots and Kinniku mysteries, I decided to go with questions that deal primarily with the International presence of Kinnikuman. After all, Nama Niku is dedicated to International Kinniku fans. Nama Niku welcomes visitors from the following countries on a daily basis, and without you I could not be doing this: USA, Japan, Germany, China, The UK, Thailand, Canada, Spain, France, Philippines and Brazil. Thank you to all my readers wherever in the world you may be ~ 友情パワー! Nama Niku: First off, it is an absolute honor and humbling experience to be granted an interview with you. Your talent and creations are so and meaningful to me that it is hard to even know where to start. The stories in Kinnikman feature characters from all over the world. What was it that interested you in introducing characters from so many different countries into the pages of your comics? Shimada-sensei: When Kinnikuman was created I wanted to create a world with a global point of view. There was only Terryman at first, and then I had the idea to hold a Choujin Olympics to make things more grandiose and interesting. At the time this happened, there was a lot of excitement around the Moscow Olympics even though there was a boycott by Japan and other Western Nations. Subsequently, in the world of the Kinnikuman comics, the Choujin Olympics were a big success and served as an opportunity for Kinnikuman to become a real hit. Nama Niku: Kinnikuman's popularity has certainly grown outside of Japan since its creation. Did you ever think the series would be popular with overseas audiences? Shimada-sensei: No, I didn't think about it at all. The story of Kinnikuman was based in a city in Japan with Japanese buildings everywhere, and Kinnikuman himself living in a Japanese style wooden house. At first we didn't even think that the manga would be made into a TV anime. At the time, Jump Comics were under the assumption that if a manga series became an animated series then they would be unable to sell magazines and books, so they were really not for the idea at first. Because of all of those factors, I had no idea that our Japan based manga would ever be popular overseas. Nama Niku: Currently, the Kinnikuman Niesei manga is being released in America by Shonen Jump/Viz Media. Are there any plans to release more Kinnikuman comics and or anime in America? Shimada-sensei: I heard that as far as the manga in America goes Nisei (Ultimate Muscle) will be the last. Kinnnikuman Nisei: Kyukyoku Choujin Tag won't be released in America, because of the bad economic state of the publishing industry. Nama Niku: You mentioned on Twitter that you were not even aware that M.U.S.C.L.E. had been released in America back in the 80's. How involved are you in the marketing of the Kinnikuman brand overseas and at home? Shimada-sensei: I didn't even know about M.U.S.C.L.E.. I discovered it on my own when I went to Hawaii. I found one just like the 4-Pack that 100t-san (Nama Niku) gave me. After that, there was talk about releasing the first anime series in America, and the editor of Jump Comics and myself were actually going to do a press conference in the US. However, due to the fact that the Mattel Kinkeshi became a huge success on their own without the anime being released, the talks for releasing the anime in America disappeared. If we had released the original series in America at that time, the 4Kids release of Kinnikuman Nisei (Ultimate Muscle) might have had better success in North America. Nama Niku: Can you tell me anything about the new Mayumi story mentioned at the recent Muscle Summit? Shimada-sensei: The time period for the story would be the Taisyo period when Japan was really going through a great and exciting time. I thought the idea of Mayumi wearing a Hakama Haori (Traditional Japanese Period Clothing) fighting with Akugyou Choujin would be really interesting. It is almost like the world of Sugata Sanshiro (Kurosawa films) and could be really interesting. Nama Niku: Is there any message that Yudetamago would like to share with their overseas fans? Shimada-sensei: The theme of Kinnikuman is world peace. Even though the Choujin bring different cultures or customs from their respective countries, when they get in the ring and fight, they do so with only their highly trained bodies, and without the use of any weapons. After these fights, they will develop their friendships and end up building many comrades without taking sides. In the end, it is alien invaders that the Choujin must band together against to fight. In this case as well, the Choujin settle their disputes and fight with only the use of their bodies and not weapons. Even in this case however they can end up being friends with these alien invaders. I want to create a world where we are all family and where Choujin are friends. Nama Niku: Thank you so very much for taking time out of your busy schedule! I felt my Nama Niku Choujin Power go up a few points this week, as the new volume of Itadaki!! Kinnikuman finally arrived in the mail from Amazon Japan. Entitled, さいきょうタッグ！ザ・マシンガンズたんじょうのまき (Greatest Tag! The Birth of the Machine Guns), this new offering is an absolute must for fans of the Stray Devil Choujin Combo. The Machine Guns Never Looked so Sweet and Cuddly. Both Sunshine and Ashuraman look amazing in this story, with Sunshine appearing in both Hell's Arch and Top form! Once again, the art work in the series is absolutely superb, with the first few pages filled with exceptionally well done renditions of some of my favorite Kinniku Universe Tag Teams. The Stray Devil Tag Team Throwing Down on Terryman. If you do not have any Itadaki!! Kinnikuman in your collection, you are missing out! Priced at only 980円, it is really hard to go wrong with this one. Another incredible release from Yudetamago! Kinnikuman Volume 37 represents the first new official issue of the original Kinnikuman series to have been released in the past 22 years. Consisting of a compilation of various choujin stories, it is without a doubt a strong addition to to previous Kinnikuman story arcs. Nakai-sensei's art work shows a level of depth and maturity that only adds to the legend and legacy of the characters now being portrayed in their later years. Warsman's origin story was masterfully written, and perhaps my favorite entry in the new volume. One of the small things that really impressed me about this release was that the actual book was printed in the same style and scale of the Kinnikuman Legends Manga re-print box set. This attention to detail creates a seamless flow in the display of the complete collection, adding even more to the quality and nostalgia of the original series. A view of my personal collection! Geronimo is arguably one of the greatest American Choujin, however the poor guy cannot even catch a break in his own country. The Geronimo Kinkeshi sculpts are notably missing from Mattel M.U.S.C.L.E. line, and his persona in Ultimate Muscle was butchered beyond belief as "Beatlebomb." Now, I'm clearly sensitive to the likely reasons for these exclusions, however anyone who has ever read Kinnikuman can attest to the fact that the character of Geronimo is far from a bad stereotype. Arches National Park is rich in Native American history, so I thought it fitting to snap a few pics of him as I was hiking there last month. Order directly from the CCP Hell Missionaries Product Page. While M.U.S.C.L.E. hats may be fairly common among fans in the States, I am pretty sure he is the only guy with one in Japan. He said he was really interested in getting the hat on Twitter, so this ユデッキー answered the call and sent one compliments of Nama Niku. He was previously in Utsunomyia on 11/28 for an exclusive Muscle Shop signing event, and clearly has a place in his heart for the local Kinnikuman fans and culinary delights. The Muscle Shop features the BamBam88 Fall/Winter collection, and only runs until 12/7! Make sure to stop by the Utsunomyia Parco and check it out if you are in the area!